Simply download the app from the App store or Google play. Then enter you name and telephone number (with country code). You will be sent a verification code via SMS – enter that and you are good to go. Simple! blinx are automatically saved to blinxbooks that you create – so no need to organise them later when there is never time. You set up the blinxbooks how you want – say one for each child or occasion like a holiday. Assign your in-crowd (mum, dad, grandma etc) to that blinxbook and those close to you will immediately receive the blinx that your child creates. Keeping it family! 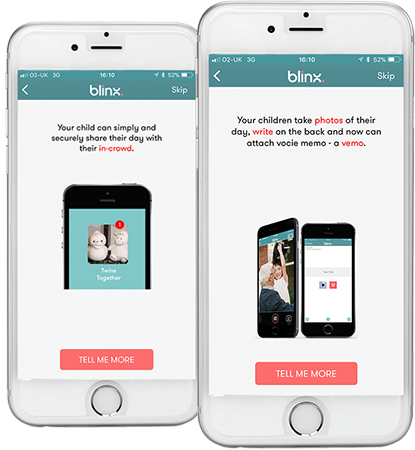 blinx keeps you all there by enabling you and a only small in-crowd of friends & relatives to create and circulate pictures and vemo (short voice messages) of the important moments in your child day. See how it works section for more details. You will be sent invitations to join close friend’s and family’s in-crowds. Simply accept to be able to journey with their children through their lives. On accepting, a blinxbook will be created on your phone - capturing the spontaneity of their days. Your blinx collection will build over time - keep only the ones you want and your most treasured ones you can even save as gems. blinx are automatically saved to blinx books that you create – so no need to organise them later when there is never time. You set up the books how you want – say one for each child or occasion like a holiday. Assign the in-crowd (mum, dad, grandma etc) to that blinx book and those close to you will immediately receive the blinx that your child creates. Keeping it family! blinx keeps you in-touch by enabling you and a small in-crowd of relatives and close friends to take and circulate pictures and vemo (short voice messages) of the fun and important things your child does while you’re not there. See how it works section for more details. You will be sent invitations to join close friend’s and family’s in-crowds. Simply accept to be able to journey with their children through their lives. On accepting, a blinx book will be created on your phone to store thoughts of their days. Your blinx collection will build over time - keep only the ones you want and your most treasured ones you can even save as gems.